Today’s testers no longer simply run tests and report bugs. Instead, they are expected to have a broad range of skills. This observation comes the way of ISTQB’s Worldwide Software Testing Practices Report 2017-18, which found that test design (67 per cent), test analysis (67 per cent), test automation (62 per cent), and test planning (60 per cent) are popular skills. Having said that, test execution (70 per cent) and bug reporting (68 per cent) remain the key responsibilities. Soft skills, business knowledge, and business analysis were the top non-testing skills. The three skills were the same for both an Agile and non-Agile context, albeit in a slightly different order. More than 2000 people from 92 countries were surveyed for the report. The majority (33 per cent) were from Asia, followed by North America and Europe (27 per cent each). More than half of respondents work in information technology organisations. Test analyst, test manager and technical test analyst titles were the top three titles used by respondents. The most common career path was Tester to Test Analyst, followed by Tester to Test Manager. As for the next step for a test manager, respondents said it was either Test Department Director or Project Manager. When it comes to the purpose for testing, detecting bugs, showing the system is working properly, and gaining confidence were the top answers. Interestingly 15 per cent of respondents said their aim was to achieve “zero defects”. Functional testing (83 per cent) was picked as the most important testing type. Acceptance testing (66 per cent) was the key topic on people’s minds, followed by exploratory testing (53 per cent). Test automation is gradually growing in importance in organisations. Although half of respondents said they use less than 10 per cent of automated test cases, almost a quarter (19 per cent) said they use more than 50 per cent. Test automation was picked as the main area for improvement in testing activities of 64 per cent of respondents. It, together with documentation and collaboration, was highlighted as a top testing challenge for Agile projects, likely due to the evolving nature of Agile software projects and/or cultural obstacles to Agile ways of working. Looking towards the near future, test automation is expected to remain a trending topic for testing professionals, as will security and Agile testing. Almost half of respondents also expect security, artificial intelligence, big data and cloud to shape the testing space in the coming years. Overall, the results of the 2017-2018 report seem to mirror those of 2015-16. While “finding bugs” remains an important task for testers, it forms only one part of the role and is increasingly being augmented by other responsibilities. 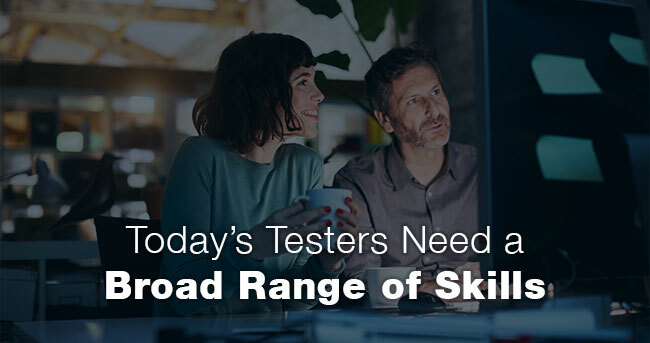 As testers are expected to take on additional duties, they look for ways to improve their competency. To that end, half of survey respondents said they rely on certification to get the necessary skills and knowhow. Becoming skilled in testing, Business Analysis, and Agile and DevOps is not easy or something you can do overnight. Contact us today to find out how our training and expertise can help transform your journey as a tester.